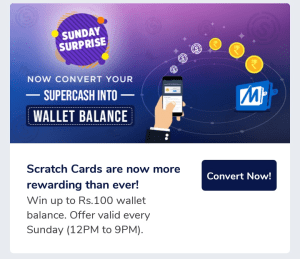 Now you can transfer Mobikwik Supercash into your Mobikwik wallet balance using the official method. Just follow instructions below. If You New User Join Using Code: 2SV6UD Add Rs.50 For Rs.100 Supercash. 2. Open App – Wallet – Balance Details – Statement – Convert To Cash – Now Buy Scratch Card For 10 Supercash. 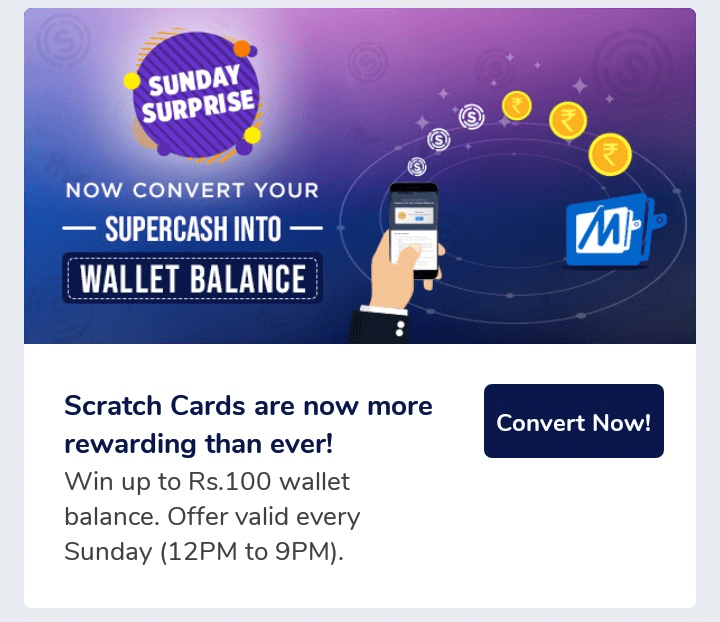 If Anyone Unable To Purchase Scratch Card Through Point 2 Steps For App Crashing Issue, Then Just Visit Home Page Of App There Is Supercash Banner (Check Our Screenshot Below) Click On That There Is Redeem Option, Now You Will Able To Purchase Without Crashing Issue. 3. You will Get Random Mobikwik Wallet Balance. I Got Rs. 9 This Month December. You Can Earn Any Amount Between Rs.1 To Rs.100 Randomly. 4. Once Per Month On Sunday Between 12 PM To 9 PM. If Scratch Out Of Stock Then Check Next Sunday Day Between 12 PM To 9 PM.